As we move into 2019, I will be taking part in the Peak District Artisans Winter Exhibition at Chatsworth House near Bakewell. Take a walk in the parkland, enjoy refreshments in the cafe and come and view the creations of a group of highly skilled artists in a range of media. The show opens on 10 January – for further information please see the exhibitions page. My next – and final – show for 2018 is on 3-4 November, with fellow members of Peak District Artisans at the Winter Artisan Fair, The Whitworth Centre, Station Road, Darley Dale, Derbyshire, DE4 2EQ. 23 artists and makers will be exhibiting so plenty of opportunity for Christmas shopping! The show is open between 10.00 and 16.00 on both days and entry is free. 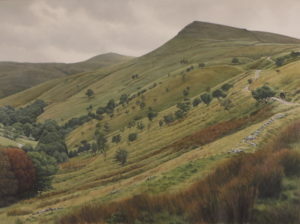 I was delighted to learn that my large watercolour painting, ‘The Pennine Bridleway near Hayfield’, had been selected for the Sunday Times Watercolour Competition. The exhibition is on at the Mall Galleries in London from 18 to 23 September 2018, before going on tour to the Guildford House Gallery from 10 November to 20 December 2018 and the Sainsbury Gallery, Willis Museum, Basingstoke from 12 January to 27 March 2019. 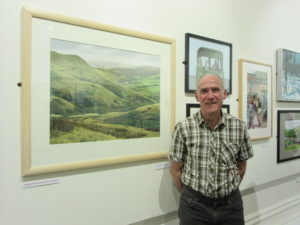 My next show will be as part of the Wirksworth Festival Art and Architecture Trail on 8 and 9 September – a great opportunity to explore the town and view a wide range of art and craft. My last event of the year will be with colleagues from Peak District Artisans as part of their Winter Artisan Fair on 3 and 4 November at the Whitworth Centre in Darley Dale. An event perfectly timed for Christmas shopping! As part of Derbyshire Open Arts I will be exhibiting this weekend at Holymoorside near Chesterfield, alongside a number of other artists across a range of disciplines. Refreshments – tea, coffee, cake and sandwiches – will also be available. After a great week at Tissington – beautiful weather and lots of visitors – I’m hoping for the same this weekend. For full details please see the exhibitions and events page. My next show will be at Tissington Well Dressings from Thursday 10 May until Wednesday 16 May, open 10.00 to 17.00. There are six beautiful well dressings, refreshments available in the village hall and Herberts Tea Room, and an opportunity to see my work. Fingers crossed the sun shines! Hope to see you there. The winter weather makes painting outside somewhat unattractive, and as a result I have been spending more time working in the studio. One outcome is a series of still life paintings, which can be found on a new page dedicated to that genre. I’m hoping the weather will eventually improve and I can get out and about again. A belated welcome to 2018 – where did January disappear to? Details of events I will be attending this year can now be found on the Exhibitions and Events page. At present I have a small selection of work on show at the Peak District Artisans event at Chatsworth House. The house itself may not be open, but there is still the joy of a walk in the park, tea and cake in the tearoom, and some fantastic art and craft to view – what’s not to like! My next and final show for 2017 will be at the Peak District Artisans Winter Fair and Banks Mill Open Studios in Derby. I will have some of my most recent work on show, and it is an ideal opportunity to stock up on cards for Christmas and those new year birthdays. With over 50 Artisan stalls and 35 Open Studios there will be a lot to see. Further details on the Exhibition and Events page.